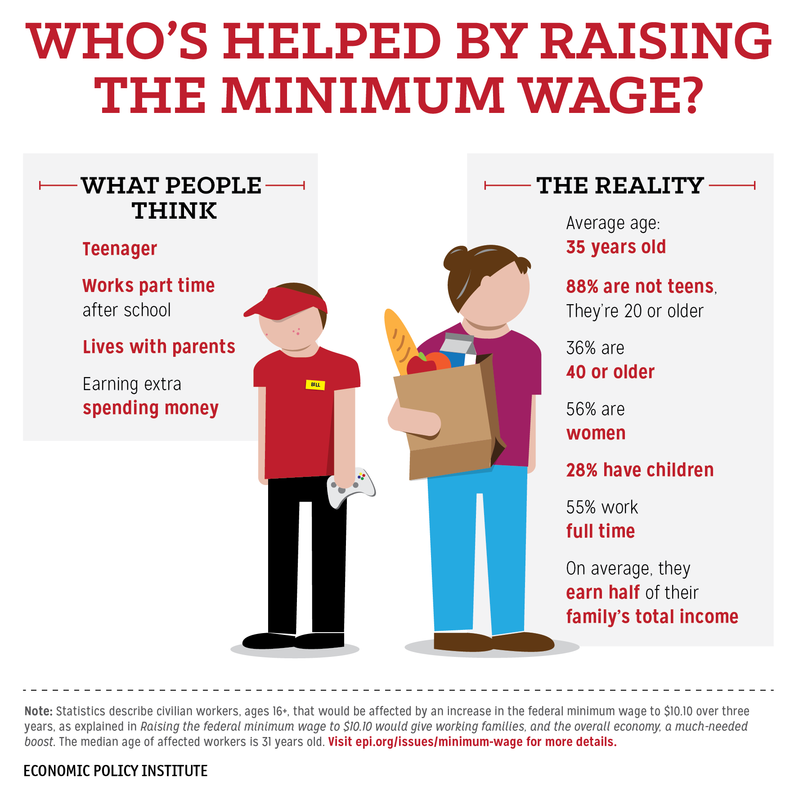 It is a common myth that very low-wage workers—workers who would see a raise if the minimum wage were increased—are mostly teenagers. The reality is that raising the federal minimum wage to $10.10 per hour would primarily benefit older workers. Eighty-eight percent of workers who would be affected by raising the minimum wage are at least 20 years old, and a third of them are at least 40 years old. Claims that mostly teenagers would see a raise if the minimum wage were increased are sometimes based erroneously upon the official Bureau of Labor Statistics data on workers who are earning the federal minimum wage or below—i.e. workers earning exactly $7.25 per hour or less. These data do not provide an accurate picture of who would see a raise if the minimum wage were increased because they exclude all workers from the 19 states with higher state minimum wages, along with all workers making slightly above the current federal minimum wage but below the proposed minimum, all of whom would see a raise if the minimum wage were increased. Also, see a comprehensive analysis of the impact of raising the minimum wage in Raising the federal minimum wage to $10.10 would give working families, and the overall economy, a much-needed boost.